Northern saw-whet owl (Aegolius acadicus) is common and widespread in many parts of North America, but it is one of the most difficult birds to see. I've only seen one in six years, despite much effort. 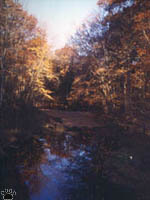 Then in October 2003, I was invited by Eugene A. Jacobs to visit Linwood Springs Research Station in central Wisconsin. 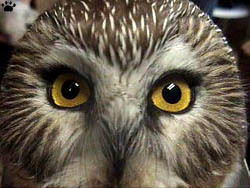 Saw-whet owls have been studied there during fall migration since 1988. I really enjoyed a chance to get some hands-on experience with these wonderful creatures of the night. 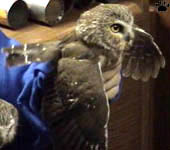 Upon capture, owls are put into metal tubes to avoid damage to their flight feathers and the personnel's hands. At the station, owls are attracted by playing their taped calls, caught by mistnets, weighed, measured, banded, and then released, usually within two hours from capture. They are easy to handle (as long as their feet are secured), surprisingly calm, and show no sign of stress. Flight feathers are examined and marked to study moult. Soft and cute as they are, these birds are a nightmare from a rodent's point of view. They are perfect hunters with soundless flight and unimaginably acute senses. Their talons seem to be even more sharp than a cat's claws. These owls apparently feel very comfortable when handled. Still, releasing them is the most pleasant part of the process. I am very grateful to Eugene and the crew for this wonderful opportunity. A small river near the station.